From ribs to hot wings, rich, tangy BBQ sauce holds a spot in every meat lover’s heart—if not a few vegetarians, too. But even if you’ve been a long-time fan of this sticky treat, you might not know the backstory. In celebration of National Sauce Month this March, national hotspot Buffalo Wild Wings® offers the following brief history lesson. 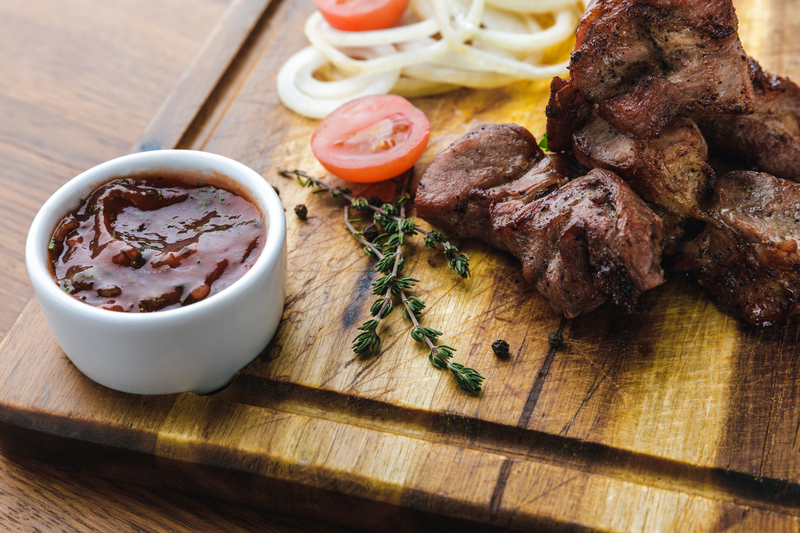 Believe it or not, the origins of BBQ sauce aren’t all that appetizing. The invention actually stemmed from the need to preserve decaying meat, but it made it even tastier in the process. Smoked meats in Europe were often flavored with wine, cider vinegar, malt, salt, and herbs, while sugar, molasses, chili peppers, and tomatoes were used to create sauces in the Americas. As exploration boomed and cultures intertwined, these various ingredients were no doubt used to experiment when making BBQ sauce. Of course, there were key differences between countries—while the French used butter, herbs, and spices to season their smoked meat, the Germans brought mustard to the table, leading to the yellow BBQ sauces still enjoyed today. In 1867, the first recipe for BBQ sauce was published in the wake of the civil war, and it included butter, vinegar, mustard, pepper, and salt. In 1909, the first commercial BBQ sauce was made and sold in Georgia, and it was advertised as a pairing for nearly every type of meat, from beef to oysters. Today, the most popular BBQ sauces are modeled after the Kansas City version, which includes tomato-based ketchup. Over the years, people all over the country have worked hard to create and perfect different BBQ sauces, and there’s no better time to sample them all than March, National Sauce Month. In fact, you can sample every one of the 16 hot wing sauces offered at your nearest Buffalo Wild Wings, which range from “mild to wild.” Start off with the Classic BBQ to ring in the celebration, then step outside your comfort zone with Bourbon Honey, Spicy Garlic, or even Thai Curry hot wings. At the end of the night, you’ll have a thorough understanding of just how much BBQ sauce can differ around the world. Celebrate this National Sauce Month with a few of your closest friends by taking up a table at Buffalo Wild Wings. There are 19 locations through New York and Connecticut, including Stamford, Danbury, and Manhattan. Stop by to sip cold beer from nucleated glasses, or catch a game over a big plate of hot wings. To learn more about their mouthwatering menu and find locations near you, visit the website.